UPDATE 8/21/12 @ 5:00 PM Manila time: Fr. Charles Belmonte has penned a longer follow-up to his original note on what is "Catholic": Fr. Charles Belmonte reminds us of the politically incorrect fact that to be rightfully called Catholic, one must be... Catholic! UPDATE 8/20/12 @ 1:50 PM Manila time: a FIFTH response, a short note from Dr. Quirino Sugon, has been added to this post. I've inserted it between Ricardo Boncan's petition and the CBCP News article on Archbishop Palma's recent remarks on this matter. The recent declaration of 192 (and counting) college-level Ateneo faculty members in favor of the RH bill is not surprising to anyone who is remotely familiar with the actual state of much of 'Catholic' higher education in the Philippines. In too many Filipino Catholic colleges and universities there is open dissent against the Magisterium, ridicule and hatred directed at the very Church that nurtures them, and a refusal to actually try to know what the Church teaches, in favor of an "academic freedom" that one-sidedly favors 'free-thinking' and often elevates childish propaganda against Catholicism to the level of protected academic speech. I do not deny that there are many good Catholic teachers and students even in the most 'secularized' of 'Catholic' schools, but their presence only makes the existence, and oftentimes the dominance, of theological dissent in Filipino Catholic institutions of higher education all the more glaring. Unfortunately, many Filipino Catholics -- clerics and laypeople alike -- had refused to acknowledge the existence of the problem. With this recent incident, it is no longer possible for Filipino Catholics to pretend that the problem does not exist. Meanwhile, I have the honor of presenting the first four public responses by Catholics to the Ateneo professors. I present them in no particular order. 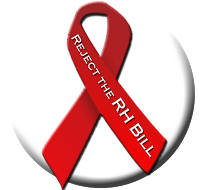 To say out front, I am against the RH bill for reasons that are very real and personal to me. But I do not intend to delve into these because there has been enough talk on the pros and cons of this bill. It is now time to make a stand. That is why I respect their opinions, no matter how flawed they are to me. What is beyond me is how they can group themselves together and make a public statement against the pronouncements of the Church of which their university is a part of. What model of respect for authority can they impart to their students when they themselves do not live it? I can be more forgiving with UP, a government university or any other non-sectarian educational academy if they support the RH bill. But for Ateneo, a recognized Catholic institution, to publicly declare their support is something that is inappropriate and leaves a bad taste in the mouth. Therefore, I challenge these renegade professors to stand their ground and resign from the Ateneo. If they do not have the decency to do that, I call on the Jesuit community running the Ateneo to mete out sanctions against them. If the Jesuits refuse to do this out of their principle of intellectual liberalism, I ask them to have the propriety of reclassifying Ateneo from being a Catholic institution to a non-sectarian university. This is a call not only for the Ateneo but for other Catholic schools who defy the teachings of the Catholic Church. 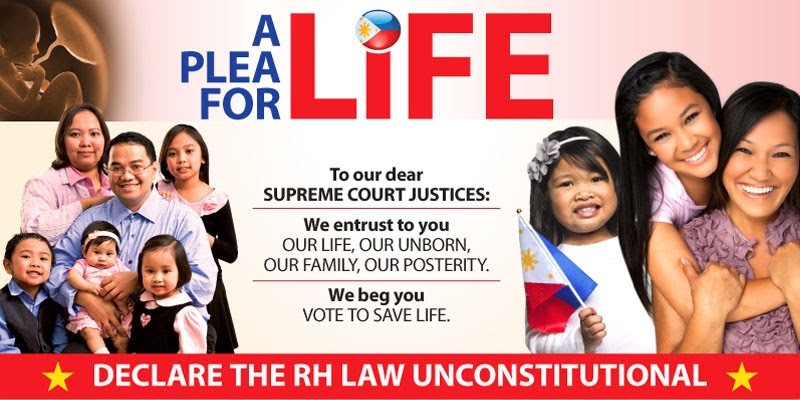 The second is an online petition launched by Catholic pro-lifer and blogger, Dr. Ricardo Boncan, who is an alumnus of ADMU. The following is the full version. A shorter version is coming out today (August 20, 2012) on the column of Antonio Montalvan II in the Philippine Daily Inquirer. As of the publication of this blog post (c. 4:00 AM on August 20 in Manila) this petition, less than 2 days old, has garnered 214 signatures. In August 2012, 160 Ateneo faculty members abused their position and misused the name of the Ateneo de Manila University, a Jesuit-run university with a Catholic mandate, to express their personal stand and agenda in favor of the Reproductive Health Bill. The administrators of the Ateneo have not done anything to answer these dissenters nor to defend Catholic teaching on the matter. This petition is to precisely ask the Jesuit Fathers for accountability. Over the past 3 years, we, concerned alumni, family and friends of the Ateneo de Manila University have stood idly silent as some Ateneo faculty members abused their position and misused the name of this Catholic university to express their personal stand and agenda in favor of the RH Bill. The memo released against this by then ADMU President Fr. Ben Nebres was one of perfunctory, mild dissociation against the, then only 70 or so, faculty members who signed on. While declaring the official Jesuit stand against contraception as being consistent with the Church, Fr. Nebres, defended their actions by defaulting to what he claimed to be, “academic freedom”, that supposedly allowed them to express their personal views as faculty members of this Catholic University. As a result of that token denouncement and “academic freedom” excuse, these faculty members have become emboldened and have come out in bigger numbers to espouse an agenda and political ideology contrary to the teachings of the Catholic Church, confidently using the good name of our school, a Catholic school, to give credence to their voice. Academic Freedom in the proper context of allowing academicians to explore the ethical and moral limits of their chosen field and teach the good that comes out of it, is a praiseworthy principle. But what has happened in this case is clearly not that! Many of these faculty members are using the name of our university, its Catholic mandate, its Catholic ties to their own ends in the disguise of academic freedom. It gives the impression to many of us Catholic alumni, friends and family of the Ateneo that our Jesuit Fathers condone this action and have abandoned their calling to fight for Catholic truths. My dear Jesuits, THIS IS NOT FREEDOM, this is ACADEMIC TYRANY. Among those held hostage by these tyrants and dissenters are the many other faculty members who have chosen to be silent for fear of being ostracized by their peers, for holding contrary views on the issue. However, the biggest and greatest casualty here are those who were entrusted to be under your intellectual and spiritual care, the STUDENTS of the Ateneo de Manila University. As Catholic priests of a canonically formed order, founded by a great saint, Ignatius of Loyola, we find this unacceptable! These students are being made collateral damage by ideologically driven faculty members who freely “educate” them with things contrary to their Catholic upbringing. We, the parents of these students have spent years bringing them up, espousing love of Christ, His Church and obedience to Catholic teaching, especially in the area of sexual morality and sending them under your care, confident in the thought, that the Ateneo would do the same and even strengthen them. All that effort, only to be undone by these anti-Catholic principles being espoused by faculty members, under your employ, teaching under the name of this great school. Article 4, “The responsibility for maintaining and strengthening the Catholic identity of the University rests primarily with the University itself. While this responsibility is entrusted principally to university authorities (including, when the positions exist, the Chancellor and/ or a Board of Trustees or equivalent body), it is shared in varying degrees by all members of the university community, and therefore calls for the recruitment of adequate university personnel, especially teachers and administrators, who are both willing and able to promote that identity. The identity of a Catholic University is essentially linked to the quality of its teachers and to respect for Catholic doctrine.” and lastly, “Those university teachers and administrators who belong to other Churches, ecclesial communities, or religions, as well as those who profess no religious belief, and also all students, are to recognize and respect the distinctive Catholic identity of the University. 1. denounce the continued misuse of the Ateneo de Manila Universityʼs name by these 160 faculty members for their statement and stand for institutionalized contraception as it is contrary to Catholic teaching. 2. ask our Jesuit Fathers, especially those in the administration, to publicly settle this matter unequivocally and strongly for the benefit of Catholic students under their care. 3. ask that an explanation to all students of the Ateneo, on the clear and unwavering position of our Catholic school and our Jesuit fathers, on the matter of artificial contraception should also be sent to parents and alumni of the university. 4. ask that a clear, strong and resolute reprimand be given to those who willfully signed that statement and made use of their position in order to voice their dissent to Catholic teaching. Inspired by this and the Ignatian motto “Lux In Domino” we pray that you, our dear Jesuit Fathers, take this letter as a show, of nothing more, than our love and concern for the school that nurtured our growth and made us what we are today, Men For Others. I signed the petition below in response to the 160 Pro-RH Ateneo professors who signed the petition in support of the RH Bill, in defiance of the Catholic Church teaching on contraception. I hope you and your other Atenean friends will also sign below. This is now a battle of the Two Standards. We need to reclaim the Catholic identity of our beloved university. Fidelity to Mary is fidelity to the Catholic Church. It cannot be otherwise. "Mary for you! For your white and blue! We pray you’ll keep us, Mary, constantly true! We pray you’ll keep us, Mary, faithful to you! "Down from the hill, down to the world go I; rememb’ring still, how the bright Blue Eagles fly. Through joys and tears, through the laughing years, we sing our battle song: Win or lose, it’s the school we choose; this is the place where we belong! "Mary for you! For your white and blue! We pray you’ll keep us, Mary, constantly true! We pray you’ll keep us, Mary, faithful to you!" MANILA, August 17, 2012— The Catholic hierarchy may strip a school of its affiliation with the church if they go against its teachings particularly on life issues, a ranking archbishop said. Archbishop Jose Palma, Catholic Bishops’ Conference of the Philippines (CBCP) president, said this is possible if a Catholic school and other institutions violated ethical and religious directives of the church. “If we are a Catholic school, we should not teach anything contrary to the official teaching of the church,” Palma said. Amid the debate on a controversial artificial contraception measure, he admitted that there is a clash of beliefs between the church and teachers of some Catholic schools. However, the Cebu archbishop said they are trying to solve the problem through a dialogue. “In some places, we first talk to them because some teachers may have some misunderstanding of what they think of freedom of conscience or academic freedom,” said Palma. “In some of the universities, we say that if you want to teach that idea, do not do it in a Catholic school because we are confusing the students… do it in other universities,” he said. The CBCP head stressed that the motive why parents send their children to Catholic schools are for reasons of faith formation. “They are hoping that their children will learn the Catholic teaching and also the Catholic formation,’ he said. “It will be a contradiction if we will bombard them with ideas which are against the official teachings of the Catholic faith,” added Palma. 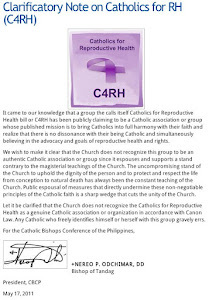 Around 160 professors of the Ateneo De Manila University (ADMU) have openly expressed their support for the passage of the reproductive health (RH) bill opposed by the Church. The professors first released this statement in 2008, and reiterated their stand recently as the House entered into the period of amendments on the RH measure. They also stated that they are not speaking for the entire Ateneo institution and only expressing their personal position. The ADMU, however, as a Jesuit and Catholic university, clarified that it still stands with the CBCP and the Philippine Province of the Society of Jesus. If you have a shop which exclusively sells pan de sal, ensaymada and mamon, don't call it "Hairdresser salon" because it is not. No insult. It's just a matter of sincerity and decency. If you have a university which hardly teaches the Catholic faith (irrelevant whether this faith is true or false), don't call it "Catholic" or "Pontifical" because it is not true. I don't know what is to be a Muslim, but I can tell you what is to be a Catholic: to be baptized, to profess the faith which the entire Catholic Church professes and has professed from the time of the Apostles (as taught by the pope and bishops) and to obey the legitimate pastors (the hierarchy). I don't think it is matter of academic freedom, but of sincerity and decency. Our situation is best summarized with the following quote from George Orwell: We have now sunk to a depth at which restatement of the obvious is the first duty of intelligent men. I wonder why the on-line petition shows a Herbert W. Armstrong Official Church of Christ website at the bottom. The petition is merely hosted in the Go Petition website. The ad for Armstrong's sect is most likely there as a paid ad, and has nothing to do with Dr. Boncan or the petition itself. See the new article by admu theologians "Statement of Catholic Theology Teachers on Conscience and Faith" on the cbcpforlife.com website.